Dr. Counihan grew up in Lexington, Ky., and earned a degree in Biomedical Engineering from the University of Virginia. She graduated from the University of Kentucky School of Medicine, where she was a member of Alpha Omega Alpha Medical Honors Society. 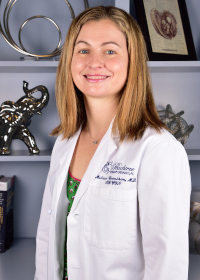 Dr. Counihan completed her residency at Emory University’s Department of Gynecology and Obstetrics. A recent member of Peachtree Women’s Specialists, she provides a full range of services related to obstetrics and gynecology and specializes in high-risk obstetrics. Dr. Counihan is married to her husband, Roger Counihan, and together they two children, son Francis and daughter Avery. In her spare time she enjoys reading, running, biking, and sailing.